Canon 100-400mm IS L zoom lens and EOS-1Ds Mark II handheld at 310mm. ISO 320. Evaluative Metering +2/3 stop: 1/160 sec. at f/5.6. Photographic Theme: Amy favorite images from the recently concluded Kenya Photo-Safari. Canon 500mm f/4L IS lens with 2X II TC and EOS-1Ds Mark II on Todd-Pod. ISO 800. Evaluative Metering +1/3 stop: 1/160 sec. at f/8. Fill flash with Better Beamer at -2 stops. 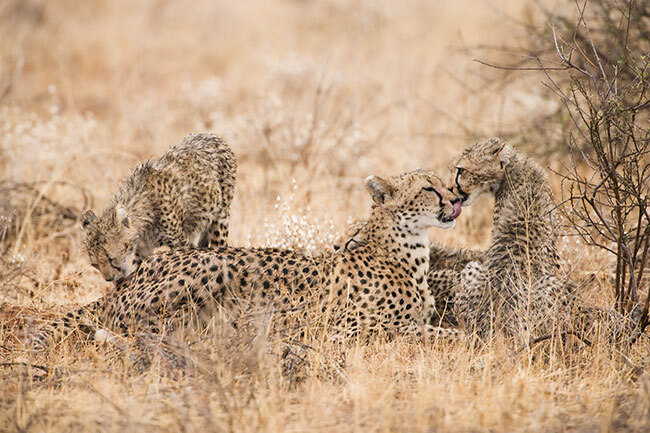 We had several Cheetah families this year. Most times they were protected from harassment by overly aggressive van drivers and photographers, so excellent long lens technique was a big plus. Todd Gustafson and I were met in Nairobi by ten lucky nature photographers. Two of the couples, Forrest and Carol Sue Roberts and Steve and Rachel Kent had been with us on last year’s Kenya safari, and Brutus Östling (a multi-IPT veteran) of Sweden and Cliff Slater of Hawaii had been to Tanzania with us previously. First-timers Michael and Annie Katz (husband and wife) and Alex Tawil (from NYC), all three fairly new to nature photography, were eager to learn, anxious to soak up as much photographic knowledge and lore as possible, and simply thrilled to be in Africa with Todd and me. We began at Lake Naivasha, where—with the extremely low lake level, the grounds were superb for bird photography. On Crescent Island, where hiking is permitted, the creek that had held large numbers of water birds in previous years was dry. We did, however, have some great chances with the Wildebeests, Common Zebras, and Defassa Waterbucks. The highlight of the visit was a four-day old giraffe. We spent an afternoon at Elsemere where the big attractions were the tame Colobus Monkeys. 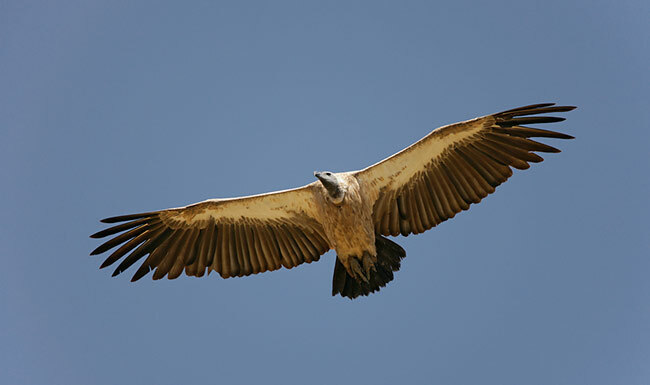 We drove back to Nairobi and hopped a flight to Samburu where many of the specialty species awaited us. 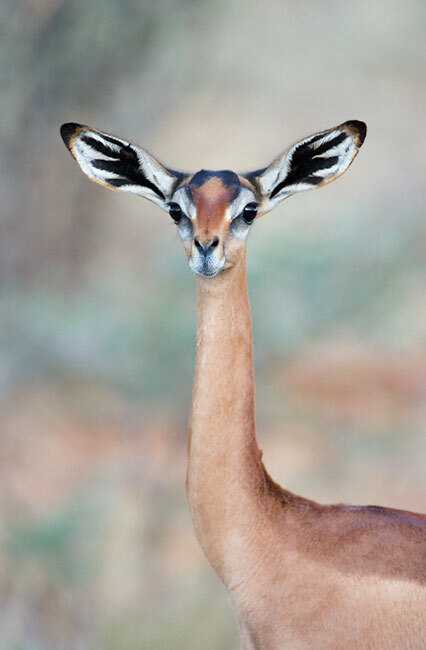 These included Grevy’s Zebra, Reticulated Giraffe, Gerenuk, Oryx, Somali Ostrich, Golden-breasted Starling, and Vulturine Guinea-Fowl. 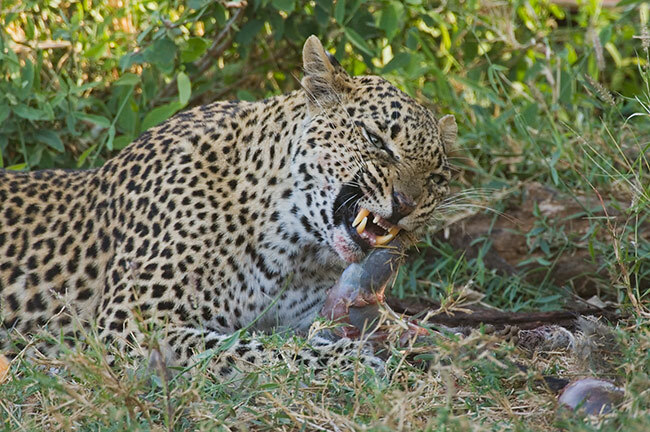 We had several Leopards as well as lots of lions and Cheetahs. We had a Cheetah kill and a Leopard kill. We flew directly from Samburu to Maasai Mara. We stayed at Samburu Sopa where the grounds were dry and hot. I built a combination water drip and feeder; within a day we had lots of great action with several species of bush passerines. The next Bulletin will feature both the set-up and the results. We spent a single night at Keekorok Lodge in the Mara. It was a lovely lodge with excellent grounds and a hippo pool. The food was the best that I had ever had in Africa. And there were lots of great photographic opportunities within a short drive of the lodge. We liked Keekorok so much that we shall be spending three nights there next September (see below for details.) Ooops, I almost forgot to mention the Leopard with two cubs… We moved to Mara Serena hard by the Mara River in hopes of getting to photograph some good crossings and we did just that. We had really good luck with the crossings (the animals are eventually headed south towards their birthing grounds in Tanzania) for the first two days and then we had some bad luck. Several times we had large numbers of Wildebeest (as many as 10,000) ready to cross, heading down to the water and acting quite frantic, only to have a safari van loaded with tourists drive right up to the edge or the river and ruin everything… The experienced drivers know that the best strategy is to stay many hundreds of yards from the river as the animals are massing and then to move slowly into position once they have started crossing On two other occasions we had great crossings in progress when a safari van on the opposite side of the river (the animals were crossing towards us) drove right into the midst of the herd… All in all it was quite frustrating, but made us appreciate our earlier good fortune. 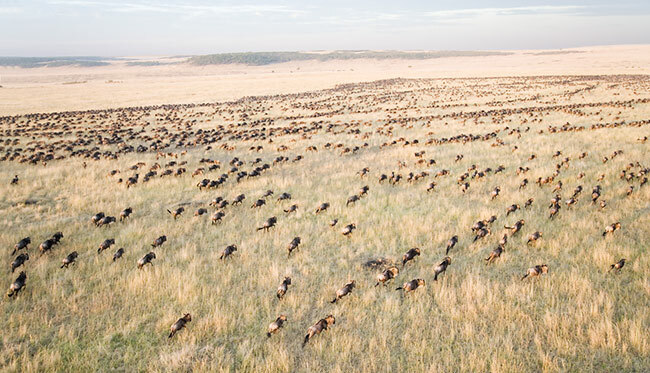 As there were more than a million Wildebeest in the park, several of us decided to do an early morning balloon flight. Todd talked me into it and I was glad that I went (even though the landing was a bit more exciting than I would have preferred…) We were lucky to catch a clear morning and the views that we enjoyed were simply breath-taking. In the future I will do a balloon ride every chance that I get. I came across a well written New York Times article by a gent taking his first balloon flight from Keekorok in 1984: http://query.nytimes.com/gst/fullpage.html?sec=travel&res=9B04EFDE1039F93BA25750C0A962948260. 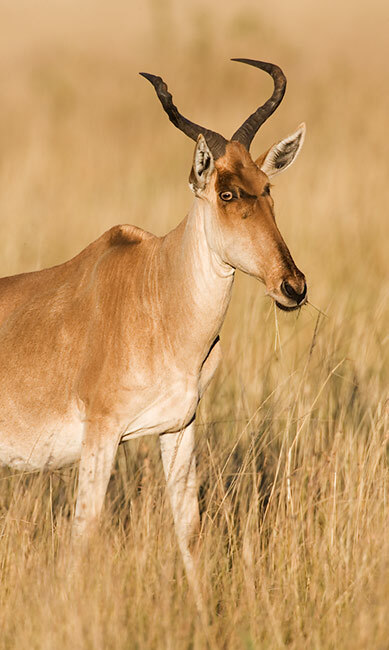 Aside from the Wildebeests we had a wealth of photographic subjects: several big prides of lions and several groups of Cheetahs, some giraffes, lots of Common Zebras, Topi, and some cooperative Hartebeest, the latter species which is usually quite shy. Three of our four vans watched a lioness take down a six month old Wildebeest so that her offspring could practice killing it. For almost 30 minutes the young lions played with the young gnu which tried over and over again to rise up and escape. Before we knew it, our safari was over and we were boarding our bush flight from the Mara back to Nairobi. The next day one of our vans watched a female lion take down a zebra. Canon 500mm f/4L IS lens with 1.4X II TC and EOS-1Ds Mark II on Todd-Pod. ISO 800. Evaluative Metering +2/3 stop: 1/200 sec. at f/5.6. 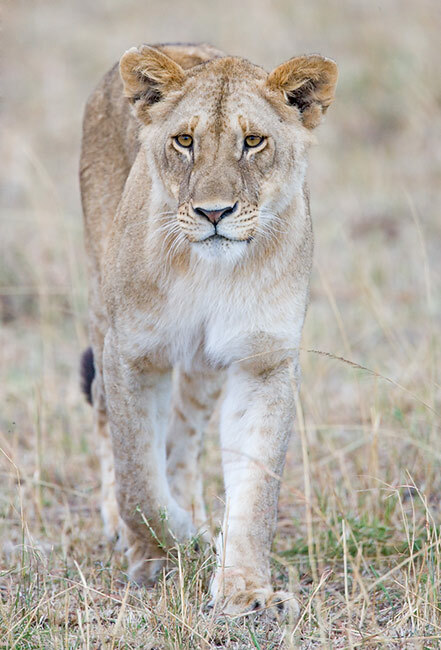 On our first afternoon at Mara, we came across a large pride of lions on the move just before sunset. Kenya 2007 Gustaphoto/BIRDS AS ART Photo-Safari/Sept. 11-27, 2007: 16 days on the ground in Kenya: $9,499.00. A non-refundable $1,000 deposit is required. A second payment of $4,499.00 is due by March 1, 2007, and the final payment of $4000.00 is due June 1, 2007. All deposits and payments should be sent to: Todd Gustafson, 2122 Elmira Ave, Des Plaines, IL 60018. Please make the checks out to “Todd Gustafson.” Thanks <smile>. We cannot guarantee a single supplement at this time but do contact us if you are interested. The registration fee includes food, lodging, ground transportation and airport transfers, driver guides, game park entry fees, and our round trip flight from Nairobi to Mara. Not included are the Kenya Visa fee ($50.00 US), personal items, all beverages, driver and staff tips, and phone, fax, e-mail or laundry charges. There is no “no-photographer” rate. September 10: fly from US. September 11: Fly Nairobi/ Overnight at the Jacaranda. Sept 12 Early flight to Mara Serena. Meet drivers there. Check in and lunch. PM game drive overnight at Mara Serena. Sept 13 AM and PM game drives at Mara Serena. Sept 14 AM and PM game drives at Mara Serena. Sept 15 AM game drive Mara Serena. After breakfast, transfer to Keekorok for PM game drive and overnight. Sept 16 AM and PM game drives Keekorok. Sept 17 AM game drive. Mid day: fly from Keekorok to Nairobi and transfer to Lake Naivasha. PM boat ride. Overnight at Naivasha CC. Sept 18 AM Crescent Island. 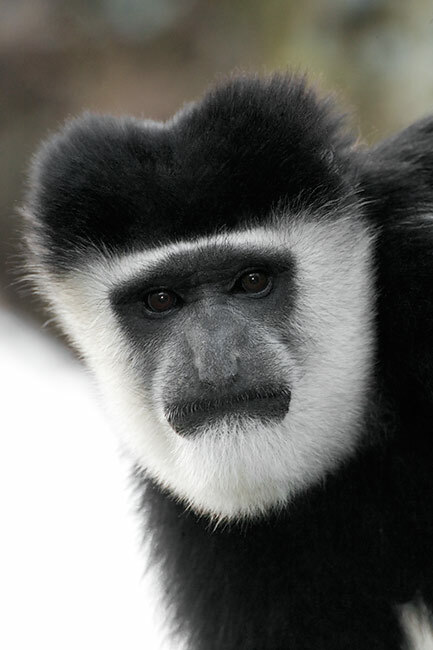 PM Elsemere for Colobus Monkeys/ Overnight at Naivasha CC. Sept 20 AM photograph on the grounds. Transfer to Lake Baringo CC. PM photograph on the grounds or at the cliffs. Sept 21 AM Boat ride on Lake Baringo. 3 people per boat-5 boats. PM photograph on the grounds (or drive to Lake Bogoria if the flamingoes are in). Cliff hike optional. Sept 22 AM Boat ride on Lake Baringo. 3 people per boat-5 boats Transfer to Lake Nakuru for lunch and PM game drive. Overnight Lake Nakuru Lodge. Sept 23 AM and PM game drives Lake Nakuru. Overnight at Lake Nakuru Lodge. Sept 24 AM and PM game drives Lake Nakuru. Overnight at Lake Nakuru Lodge. Sept 25 AM and PM game drives Lake Nakuru. Overnight at Lake Nakuru Lodge. Sept 26 AM and PM game drives Lake Nakuru. Overnight at Lake Nakuru Lodge. Sept 27 AM game drive/transfer to Nairobi. Lunch at Carnivore. We will have 9 day-rooms at the Jacaranda Hotel. Transfer to airport for flight from Nairobi. This trip will most likely sell out in short order so if you are serious about joining us please do not hesitate. Canon 500mm f/4L IS lens with 1.4X II TC and EOS-1Ds Mark II on Todd-Pod. ISO 200. Evaluative Metering +1/3 stop: 1/15 sec. at f/20 in Tv Mode. 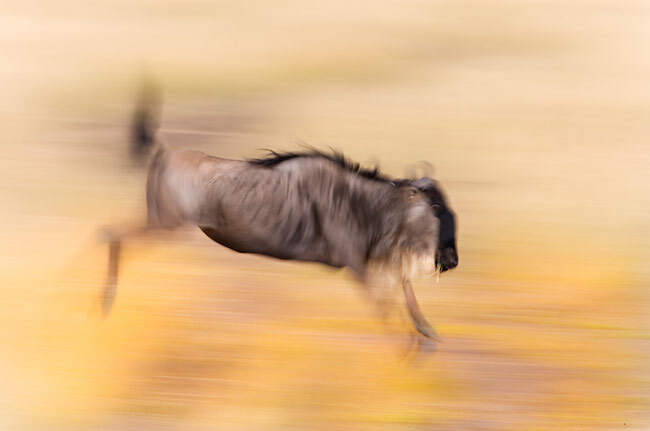 If, after a few days in Africa, you began to think, “What, I already have enough Wildebeest images,” you will be missing many wonderful opportunities. On our Photo-Safaris Todd and I try to teach folks to see the image and to think outside the box (just as I do on my IPTs). By working in Tv Mode, you can maintain total control over the blur speed, and with digital, you can see how your images look by viewing them on the LCD and then adjusting the shutter speed to taste. Nature-Scapes.net is and has been for some time the premier educational nature photography site on the planet. The link above takes you to the current Image of the Week Gallery where the moderators have chosen the best single image from each gallery for each week. From the link above, you can of course access the Avian Gallery (my favorite). Do take a few minutes to visit each of the galleries which are packed with great photographs and some good critiquing. (As with many on-line sites there are a bit too many “great shots” and “that’s the best image I’ve ever seen” comments and not quite enough honest critiques, but still there is tons to learn and lots of great images to enjoy. Congrats to Gregory, Heather, and E.J. for creating this great site. Canon 24-105mm IS L lens with EOS-1Ds Mark II (handheld at 35mm). ISO 400. Evaluative Metering +2/3 stop: 1/200 sec. at f/4. Todd, who had been in a balloon several times, suggested that I bring my new 24-105mm IS and my 70-200 f/2.8 IS. His suggestions were right-on. Due to cancellations, there are single openings on Bosque IPT #1 and Bosque IPT #2. (Both had been long-sold out.) If you would like to register, please e-mail or call first and then send your deposit check. Bosque #2: "The Pre-Thanksgiving IPT" NOV 19-21, 2006. Slide Program on the evening of NOV 18. 3-DAY: $929. (One opening.) This and the next IPT have sold out for the past eight years. If you are interested in attending the Thanksgiving Day luncheon in Las Lunas, please contact us via e-mail. This IPT will feature increasing numbers of geese and cranes with lots of great opportunities. Bosque IPTs #3 & #4 are sold out with short waiting lists. Canon 500mm f/4L IS lens 1.4X II TC and EOS-1Ds Mark II Gitzo 1325 tripod with V-2 Wimberley head. ISO 200. Evaluative Metering at zero: 1/640 sec. at f/8. I had been at Naivasha Country Club only once, in 1998 on my first trip to Kenya. 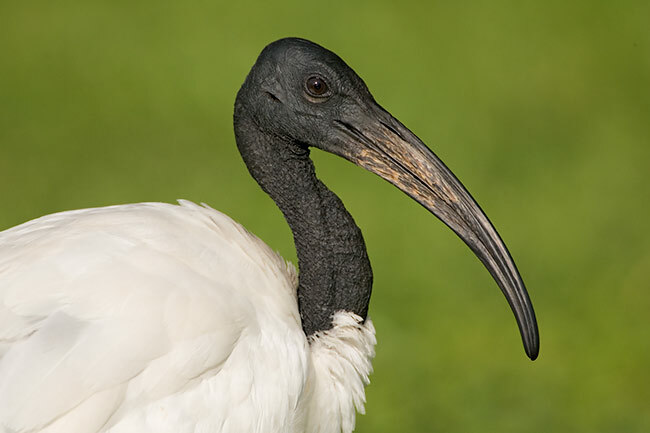 Knowing that the Sacred Ibis on the lawn there were somewhat tame, I was eager to return and to make images like this with digital which is far better able to deal with the bright whites and the black blacks than film. Here, a quick check of the histogram ensured that I would maintain detail in the white highlights while revealing detail in the crinkly black skin. Now is the perfect time to order your Site Guide if you will be visiting Bosque or San Diego for the first time or traveling to Florida this winter. Subscriber Peggy Flood is offering a like-new Canon 400mm f/5.6L lens for sale for $850.00. The lens is 1 ½ years old and was only used once. The sale includes all original materials and the case. The buyer plays shipping & insurance. Please contact Peggy Flood (Ridgeland, MS.) by e-mail at pwf789@bellsouth.net or by phone at 1-601-853-3514 or 1-601-278-1437 (cell). In addition to being the world’s best flight photography lens, the 400 f/5.6 would make a great started lens for someone with a 1.6 multiplier effect camera body. Canon 500mm f/4L IS lens with EOS-1Ds Mark II on Todd-Pod. ISO 400. Evaluative Metering +2/3 stop: 1/1000 sec. at f/4. 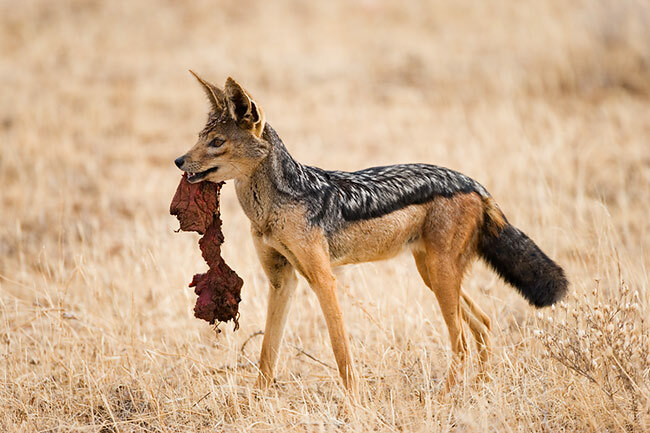 When we came across an old kill with several vultures hanging around we noticed two jackals joining them. Though my heart was pounding, I was able to make a wonderful image. I have been making about 80% of my RAW conversions with Adobe Camera Raw for the past six months or so, but have not been thrilled with the color (as compared with Breezebrowser conversions). I have gone to ACR mainly to take advantage of the speed and the color temperature slider. In addition, I like being able to click on Previous Conversion in the Settings box when converting similar images consecutively. Many of the images converted in ACR, like the jackal image above, appear too red to my eye. I have come up with a fairly good fix: click on the Calibrate Tab. Reduce the Red Saturation 20 points to -20. Reduce the Blue Saturation 10 points to -10. Now click on the right-pointing drop-down menu arrow to the right of the Settings box and click on Save Settings… Name the settings group and then click on Save. (I named this group “Reduced Calibration Saturation.”) Once Photoshop is open, this setting will come up conversion after conversion. If you are just opening Photoshop, you may or may not have to select your saved settings from the drop-down menu. That said, I have been noticing that in addition to better shadow detail, Breezebrowser conversions offer better highlight detail as well. Right now I am beginning to go back to Breezebroswer for truer color and better shadow and highlight detail… Is the speed of ACR worth producing images of slightly lesser quality??? Stay tuned. The best news of all is that the workflows for converting images in both Breezebrowser and Adobe Camera Raw are included in our Digital Basics File: http://www.birdsasart.com/digitalbasics.htm. I hope to be updating Digital Basics before I head to Bosque in November. The update will include some great new stuff that I have learned about making Color Selections, enriching the color and detail in highlight areas, and lightening dark backgrounds (and lots, lots more). We encourage folks to own both “The Art of Bird Photography II (936 pages on CD only) and the Digital Basics file as the latter includes free updates every six to twelve months. Canon 500mm f/4L IS lens with 1.4X II TC and EOS-1Ds Mark II handheld. ISO 160. Evaluative Metering +1/3 stop: 1/500 sec. at f/5.6. A fairly stiff east wind blows most mornings at the Mara. If you can find a fresh kill in mid-morning, you will be in for some great flight photography. Here, with many vultures circling uncharacteristically overhead, I took the 500 off the Todd-Pod and pointed it towards the heavens. Not sure why I had set ISO 160 as I would have preferred a faster shutter speed, but all’s well that ends well. When folks write complaining that they are unable to open or receive Bulletins, Site Guide PDFs, or the Digital Basics PDF, 99% of the time the folks complaining have aol e-mail addresses. As a former aol use, I can state unequivocally that aol is the worst e-mail provider on the planet. They should give aol a Nobel Prize for advertising; they have the worst service and the most subscribers… Whenever we send a Bulletin, aol blocks all of my sending addresses for roughly 24 hours. All e-mails that I send, whether from our att account or our verizon account, are kicked back to us, making it impossible to correspond with friends, clients, and customers for roughly one full day. We do make an effort to re-send the blocked e-mails but are not always successful. I highly recommend that all aol customers immediately switch to another e-mail provider, and that goes double for anyone who relies on e-mail for doing business. Those who do switch will be amazed at the ease of using their new service and will be astonished at the number of convenient features offered by all other providers that are not provided by aol. When I let folks know how I feel about aol many of them respond by saying, “You are right. I hate aol, but it is too hard to change.,” do understand that changing your e-mail provider and your e-mail address is no big deal… And let this notice serve as your inspiration to switch. Canon 500mm f/4L IS lens with 2X II TC and EOS-1Ds Mark II on Todd-Pod. ISO 400. Evaluative Metering +2/3 stop: 1/500 sec. at f/10. Taking advantage of a rare chance to get close to this species, I went with the 2X TC so that I could create a front-end vertical portrait. After flying back to the states from Nairobi, I got back to my office/home in Indian Lake Estates, FL on Thursday, September 7. Early the next morning, older daughter Jennifer drove me to an outpatient surgery clinic in Sebring, FL where I underwent surgery to repair the inguinal hernia that I had discovered the day before I flew to Ecuador in late June. The doctor stated that is was a large hernia; he had used a mesh patch to repair it. Though I cannot remember ever taking a pain pill in my life, I quickly realized as we headed home that I would need to take them in this case… Jennifer was kind enough to stay with me on Friday night. My recovery is proceeding apace and I am feeling great. I hope to get out to DeSoto in a week or two at most. As a precaution I will probably just take a hand-holdable lens and see what I can do. Canon 500mm f/4L IS lens with 2X II TC and EOS-1Ds Mark on Gitzo 1325 tripod with V-2 Wimberley head. ISO 640. Evaluative Metering +1/3 stop: 1/125 sec. at f/8. Fill flash with Better Beamer at -2 stops. 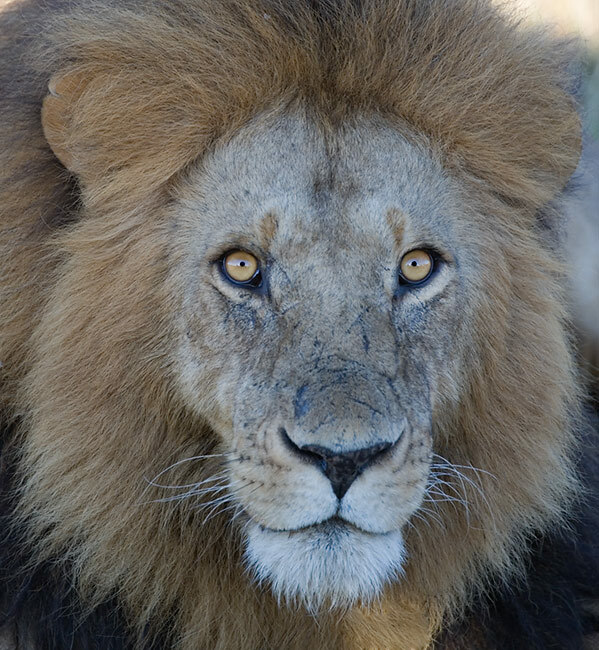 Elsemere, once the home of Joy Adamson of 'Born Free' fame, is the best place in Africa to photograph this normally shy species. In addition to the monkeys, we had some good chances with the songbirds that were attracted to the flowers, Purple Grenadier and Bronze Sunbird. Here, the sky is overexposed and detail-less to allow for detail in the black fur. Canon 500mm f/4L IS lens with 1.4X II TC and EOS-1D Mark IIN on Gitzo 1325 tripod with V-2 Wimberley head. ISO 400. Evaluative Metering +1 1/3 stops: 1/320 sec. at f/5.6. Fill flash with Better Beamer at -2 stops. This elegant gull is another species that I remember from my 1998 visit. Here, I used One-Shot AF, focused on the bird’s eye, and recomposed. We will be returning to Naivasha in 2007; in 2006 we had lots of great opportunities down by the boat dock. Evaluative Metering at zero: 1/125 sec. at f/8. SW FLA Post X-mas IPT: DEC 27-29, 2006. Slide program on the evening of Tuesday, DEC 26. 3 -DAY: $1029. (Limit 14, Openings: 10.) Co-leaders: Robert O’Toole, Alfred Forns, & Robert Amoruso. Sanibel Island, Little Estero Lagoon, Venice Rookery, Cape Coral. Herons, egrets, gulls, terns, skimmers, shorebirds, both pelicans, Osprey, Burrowing Owl, and lots more. San Diego IPT: FEB 3-6, 2007. 4-FULL DAYS: $1359. Introductory slide program on the evening of Thursday, FEB 2. (Limit 12, Openings: 10.) LaJolla, Shores Beach, Coronado, and Santee Lakes. Brown Pelicans, Heerman’s & Western Gulls, Marbled Godwits & lots more shorebirds, Wood & Ring-necked Ducks & Lesser Scaup. And lots more. SW FLA President's Holiday IPT: FEB 17-21, 2007. Slide program on the evening Friday, FEB 16, 2007. 5-DAY: $1649. (Limit 14; openings 8.) Co-leaders: Robert O’Toole, Alfred Forns, & Robert Amoruso. Sanibel Island, Little Estero Lagoon, Venice Rookery, Cape Coral. Herons, egrets, gulls, terns, skimmers, shorebirds, both pelicans, Osprey, Burrowing Owl, and lots more. Fort DeSoto IPT: APR 13-15, 2007. Slide program on the evening of Thursday, APR 12. 3-DAY: $999 (Limit 14: (Sold out.) Co-leaders: Robert O’Toole, Alfred Forns, Robert Amoruso, and Todd Gustafson. 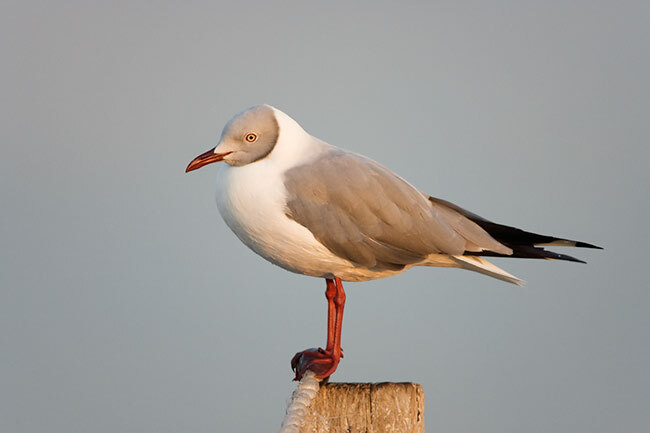 Courtship and breeding behaviors of Laughing Gull and Royal and Sandwich Terns. Herons, egrets (including both dark and light phase Reddish Egret), shorebirds (including Long-billed Curlew), gulls, terns, and skimmers among others. Silver Salmon Creek: August 8-14, 2007. Coastal Brown Bears catching salmon, Horned Puffins, macro, scenics, and fishing (optional): $4999. ( Limit 12: openings: 6) Three leaders, two TBA (plus me <smile>. Canon 500mm f/4L IS lens with 1.4X II TC and EOS-1Ds Mark II on Todd-Pod. ISO 500. Evaluative Metering 1/3 stop: 1/200 sec. at f/5.6. Fill flash with Better Beamer at -2 stops. Here, I was glad to have a chance to create an image in the BIRDS AS ART style; having the background far from the subject allowed for the soft, out-of-focus pastel background. .